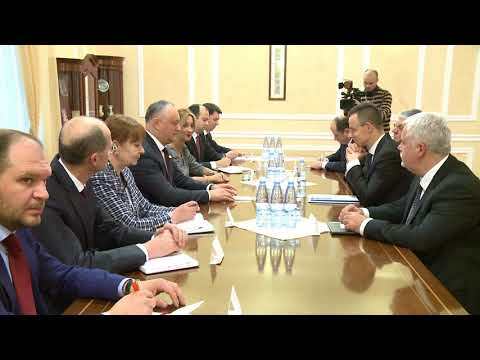 President of Moldova Igor Dodon held a meeting with the Minister of Foreign Affairs and Foreign Trade of Hungary, Peter Siyarto, who was on an official visit to the Republic of Moldova. During the dialogue, the sides touched upon a number of aspects of bilateral relations between Moldova and Hungary. They noted the importance of strengthening the political dialogue between our states. The Moldovan President expressed gratitude to the Hungarian side for the assistance rendered to our country in various fields. “We have come to the conclusion that we have a common vision on many processes in the region, mainly to the risks and challenges that countries in this zone are exposed to. I supported a more dynamic trade exchange, as well as its deepening through various joint projects as well as participation of the Hungarian companies in the activities of the Free Economic Zones and Industrial Parks in the Republic of Moldova, which provide favorable conditions for investors”, - said the Head of State. Igor Dodon also confirmed invitation to the President of Hungary Janos Ader to visit our country on an official visit during this year. He also noted that the Republic of Moldova should maintain friendly relations with both the East and the West for the benefit of citizens and the whole country.